Installation of a new bathroom is a project that can add value to you home and an immeasurable amount of enjoyment. 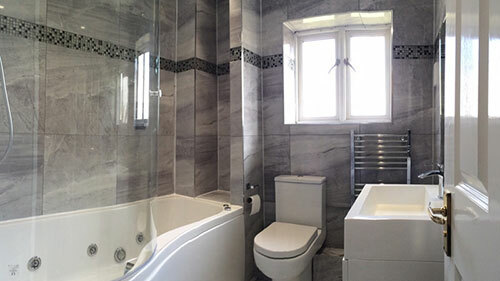 In order to successfully complete such a project, however, it’s vital to work with a bathroom fitter in Tonbridge that has the expertise to complete a project on time, on budget, and to the highest standard. AC Installations, a leading bathroom fitter in Tonbridge, has the necessary experience and expertise to help transform your existing bathroom into one that is contemporary and modern. With over 20 years’ experience and having worked with bathroom materials from such manufacturers as MFI, Homebase, Wickes, and more, you can be confident that the level of bathroom fitting you receive is among the best in the South East. Our past customers can testify for the quality of the projects we’ve completed over the years, with our bathroom fitting services helping a host of clients, big and small. We have a presence on such industry leading websites as My Builder and Check a Trade, so you can see for yourself what customers in Tonbridge make of the bathrooms we’ve provided. To find out more about AC Installations, and to book a bathroom fitter in Tonbridge you can depend on, contact our friendly team today on 07781 622940. We’ll be happy to discuss your bathroom requirements, and will take the first steps in the complete bathroom fitting project management service we provide. With AC Installations, you can be confident that you’re investing in tradesmen you can trust to deliver.